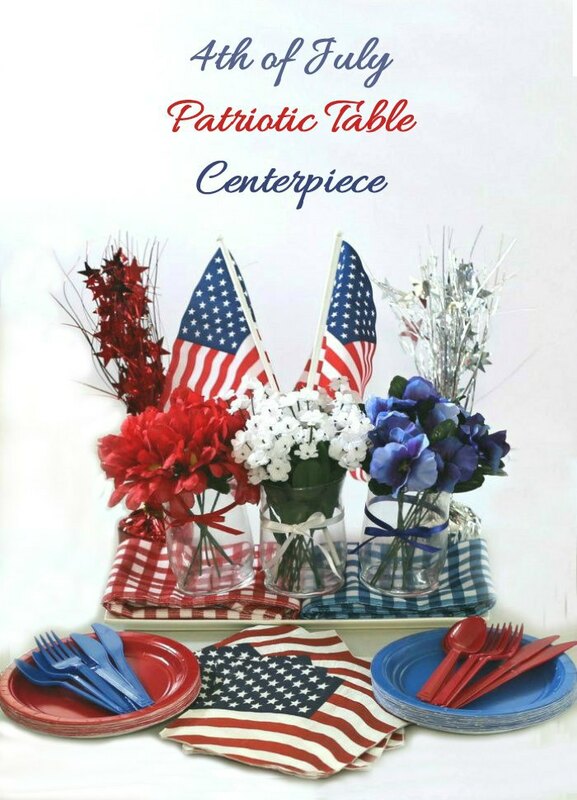 This patriotic decoration will add loads of 4th of July Decor to any party table. 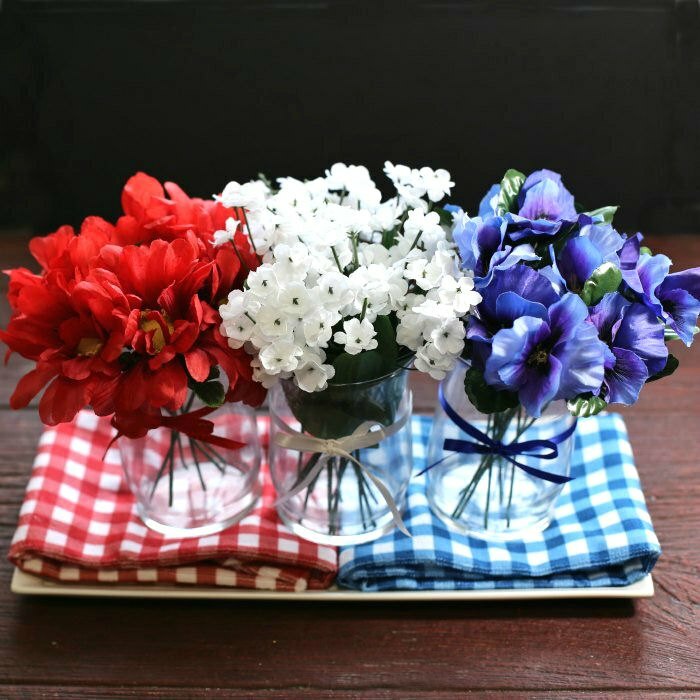 The easy flower centerpiece can be assembled in just minutes and is perfect for a July 4th BBQ. Summer is a busy time at our house, so easy crafts are on my mind. I like to make something that will come together in just minutes and will also allow me to use items that I have on hand without having to make an extra trip to the craft store. 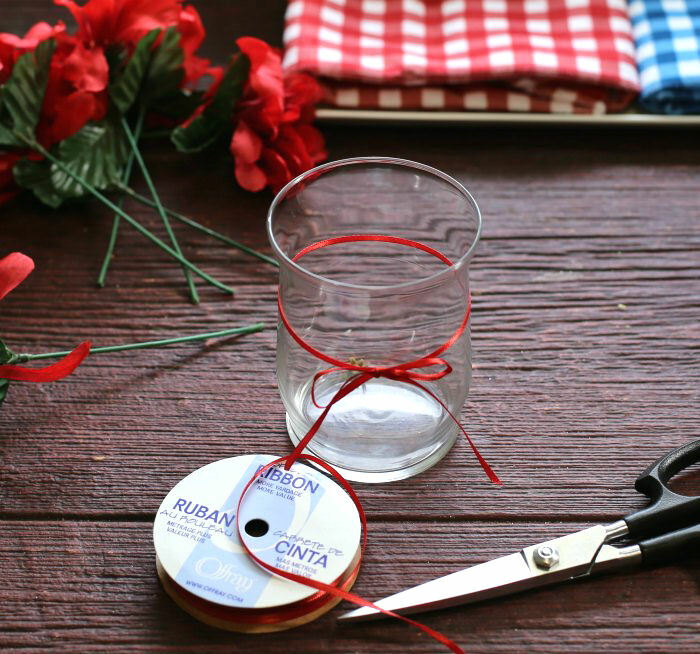 This simple centerpiece is the easiest of 4th of July decorations. All you need are just a few supplies. I had mine on hand from a recent trip to the Dollar Store, but Amazon also has supplies for this project if you need them. Start by folding your tea towels so that on side is red and white and the other side is blue and white and position them in the white serving plate. 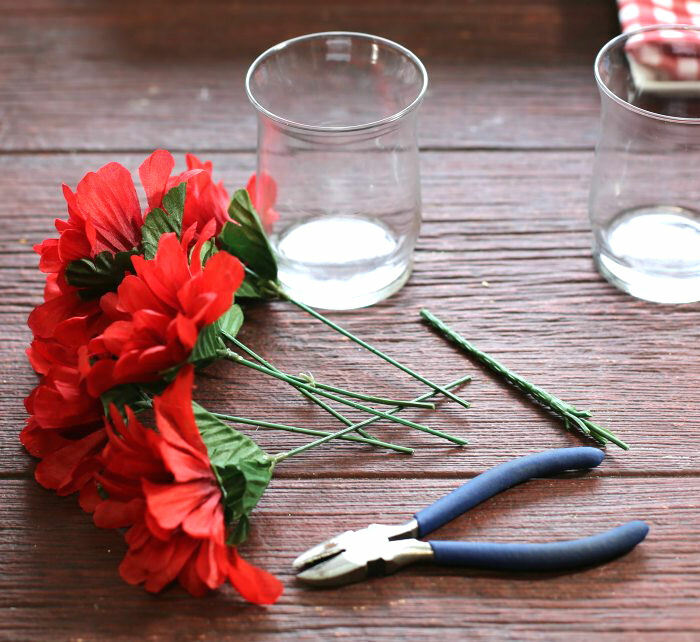 Measure the height of your glasses and use the wire snips to try the pieces of the silk flowers so that they are all the same height and will sit nicely in the glasses without toppling over. Be sure to measure the stems against each other. Mine were all different heights and I wanted my centerpiece to match across the top of the flowers. The final step is to cut a piece of 1/4″ ribbon in red, white and blue about 18″ long. Tie the ribbon around the center of the glasses and match the color to the flowers. Position the bow and trim the ends of the ribbon for a tidy appearance. Repeat for all three glasses and ribbons. Place the glasses with the flowers in them in the red, white and blue order on top of the plate with the tea towels on it. Tada! 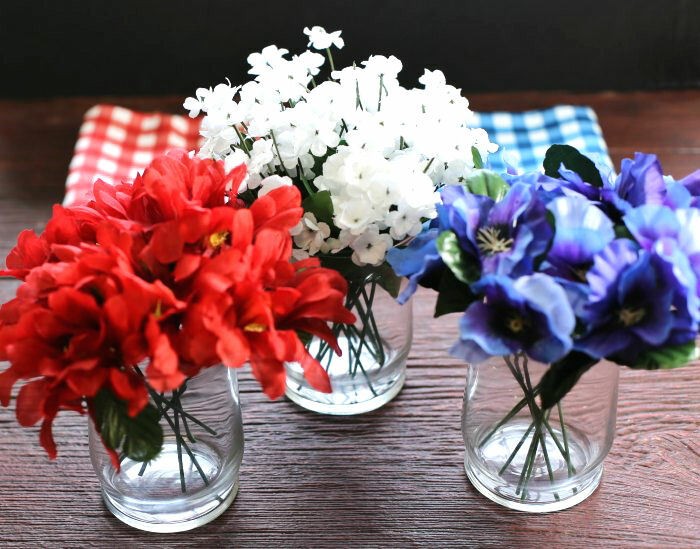 That is all there is to this red, white and blue flowers centerpiece. These red white and blue decorations are pretty enough to display just as they are, or you can add a few more Patriotic items, such as flag or patriotic table weights for a more dramatic effect. 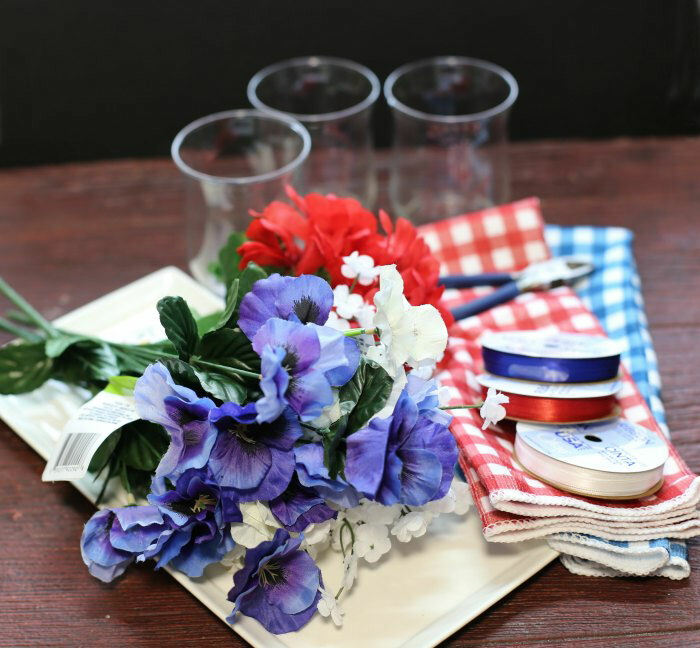 Either way, this patriotic craft idea will set the mood for a fun party. I had some flag napkins, and two sparklers, as well as some red and blue plates and cutlery left over from last year. They make the table look so pretty and the flower centerpiece looks right at home in the middle of them! If you are looking for some patriotic recipes for your party, check out this post. 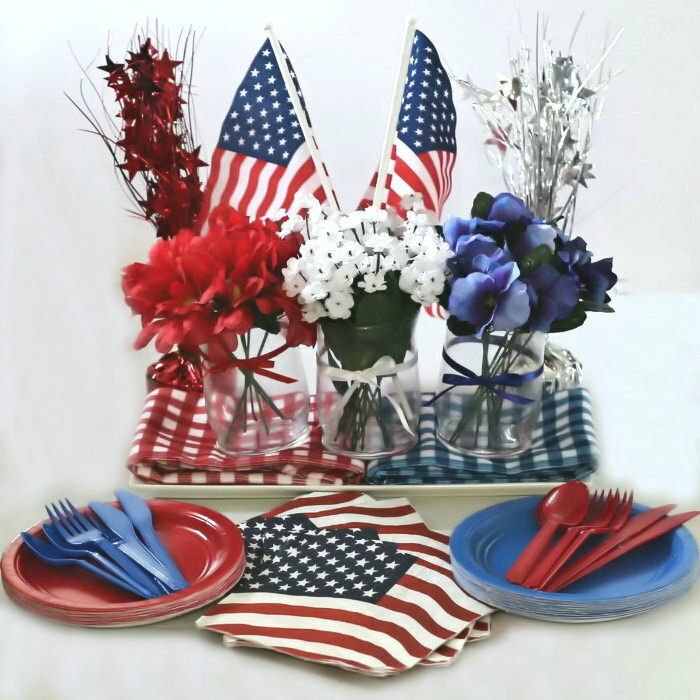 What do you add to your 4th of July table to put people in a patriotic mood?